The Midnight Review: I'm A U.S. Constitutional Watchdog! You can be a “Constitutional Watchdog” for America. I’m shifting my focus to another project: I’ll still be here, doing my shows on TV and radio, but our attention will be on something else, which I’ll tell you about when I can. So we need you to keep watch over the most perfect political document ever given to mankind. Heaven knows our politicians aren’t doing it. Go to my Web site — GlennBeck.com — and look for the shield you see here at the bottom of the screen for more details. Briefly here it is: Don’t try to pay attention to everything — it’s impossible. As we’ve discussed, they’re throwing so much at us at once — again, by design — that it’s just too much to assimilate. Find something that you know about or have interest in. Watch what Congress is doing on that. If it’s cap-and-trade, look for everything you can find on that issue. Whatever it is, when something comes up that doesn’t sound right, start barking loudly, like the Constitutional Watchdog you are. Send me an e-mail or tweet and we’ll highlight the story you’ve uncovered. 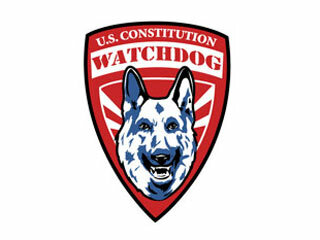 When you see the Watchdog Shield, you’ll know that it wasn’t us who found the story — it was one of our Watchdogs. Maybe the teabaggers should listen to their messiah more closely - should they actually practice what they preach they would realize that their ignorance on matters, such as their opposition to the Islamic community center known as Park51, would violate their very own "principles." What I found interesting is that if you look at the excerpt from Beck's page, nowhere does it say anything about the Constitution (except for the name of the watchdog badge). Beck asks his followers to "start barking loudly" at things that don't sound right. Again, consider the "Ground Zero mosque" - while even Beck agreed that it is their Constitutional right to build their place of worship, he feels that it is wrong and has pretty much unleashed his "watchdogs" after the Muslims who wish to exercise their freedoms granted to them by the Constitution. The 912 Project is nothing more then another Glenn Beck exploitation of idiots. Is the 912 Project even a non-profit organization or just another extension of Mercury Radio Arts - Glenn Beck's media firm? Unfortunately, Beck's followers have refused to answer any questions and follow their leader and when anyone else raises such question, they just "bark loudly" to drown out any raational thought.